I've always wanted to do this, but never got around to it. Morgan Spurlock did it in Super Size Me , but for only about a year as I recall. But Karen Hanrahan has kept a McDonald's hamburger since 1996. Yup, she's had this burger for 12 years! And it still looks ready to eat. That's frightening! Trust me, if you grilled a burger and put it on a bun and put it in a container for a month, you'd have to scrape the mold off just to see it. As Karen says, "Ladies, Gentleman, and children alike - this is a chemical food. There is absolutely no nutrition here." Karen is a wellness consultant and uses the 12 year old burger as a prop in her talks. See all the photos and read Karen's description on her blog, "Best of Mother Earth ~ Creating Healthier Lives". UPDATE: Regarding the hamburger wrapper in the photo that is clearly a more current wrapper with the "I'm lovin' it" slogan, Karen explains this in her post: "The paper and bag in the backround is circa 2008 - to add decor to the photo. My friend Robyn's idea." Enriched flour (bleached wheat flour, malted barley flour, niacin, reduced iron, thiamin mononitrate, riboflavin, folic acid), water, high fructose corn syrup, yeast, partially hydrogenated soybean oil, soybean oil, canola oil, contains 2% or less of each of the following: salt, wheat gluten, calcium sulfate, soy flour, ammonium sulfate, calcium carbonate, calcium phosphate, monocalcium phosphate, ammonium chloride, baking soda, sorbic acid, deactivated dry yeast, dough conditioners (may contain one or more the following: distilled monoglycerides, DATEM, sodium stearoyl lactylate, calcium peroxide, ascorbic acid, azodicarbonamide, mono- and diglycerides, enzymes, guar gum), calcium propionate & sodium propionate (preservatives), soy lecithin. Note: Calcium and Sodium Propionate are 'mold inhibitors,' hence the fresh looking 12 year old bun! True, I should have explained this, as Karen does in her article: "The paper and bag in the backround is circa 2008 - to add decor to the photo. My friend Robyn's idea." 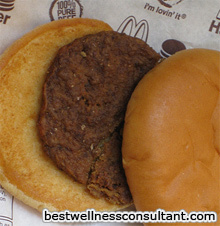 Sure do appreciate the additional commentary on the burger picture that was the hum of the day today on the blogosphere! I find Miss Hanrahan's comment comical. After reading her blog site, I see she has no degree in nutrition or "wellness", and she is a Shaklee salesperson. I also read that 2 years ago she wore a size 24 jeans (that is morbidly obese) and now wears a 16 (still large). Since she says she has "13 years experience" as a "wellness consultant", I assume she was doing this in her size 24 jeans. Interesting. I DO have a degree in Nutrition from a very good university, and seeing someone who has no degree writing about nutrition/vitamins/wellness is,to me, a fraud. Miss Hanrahan - either get a real education or stop "wellness counselling"
Read her F&Q revised blog - the burger and bun were separated and put on a plate in her cupboard for a year. Had she put the hamburger on the bun right into the plastic container - yes - it would have gotten moldly. Hasn't anyone heard of stale bread of beef jerky? This picture is not likely 12 years old. You can clearly see on the wrapper the McDonald's "I'm Lovin' It" campaign slogan, which was not begun until 2003. Correct! The picture is not 12 years old, the burger is! The "I'm lovin' it" wrapper is explained at the end of the post. Anyone could take picture of a McDonald's burger and claim it was twelve years old! Anyone who believes this pile of tripe would have to qualify as one of the most gullible people on the planet. I used to work at McDonalds while in high school, and trust me, after a few days, the buns grow mold. Also, on more than one occasion I had to sweep a moldy beef patty out from under something. PATHETIC. As I read these comments I find it interesting to note those with the normal perfunctory derogation comments attack the messenger an age old tactic. Is it important the author of any article have a plethora of artificial credentials behind or in front of their name before what they offer deemed legitimate...? I might have to give this story some credence because something like this happened to me about 6 weeks ago. My car's alternator went out while I was driving home. The towtruck came out and took the car to the repair place to be fixed the following week. It was actually about 3 weeks before I was able to pick up the car. In the back seat was a McD's quarter pounder and fries in a paper bag. This was this summer, in July. Anyway the McDonald's sack didn't stink, the food was dessicated but not moldy or stinky. The car had been locked up tight all that time. I have a McDonald's burger born on May 15, 2001, in the original wrapper. I too use it to characterize our food culture during nutrition education lectures. Even the pickles are whole and intact! The burger just dessicated. The water leached out before bacteria had a chance to flourish. And yes, the same thing has happened to me with home-made burgers. If they are cooked and the environment they are in is low-humidity, this is what happens. to "anne"- the most incompetent of any field, especially nutrition, are the ones who lean their "degrees" as if that somehow proves they know anything other than how to borrow money and regurgitate test questions. Calling someone else a fraud because they didn't jump on the same hamster wheel as you ereally shows what a mindless tool you are, and an insecure one at that.